Airlines know the times and dates that attract the most travel and inflate their fare prices accordingly. Certain months (e.g. June-August, December-January) and days (e.g. Monday, Friday and Sunday) are simply going to cost you a few extra bucks. Consider travelling during the off-peak season or catching the unpopular red-eye flights to save more. When booking from a travel website such as Expedia or Opodo, check for added surcharges before booking your flight. Some airlines charge extra fees to customers that purchase flights through a third party. Lufthansa is one such example. In a bid to steer customers towards the airline’s own booking platform, the Star Alliance member has started imposing a €16 fee to any customer who books flights through another website. When booking flights on an international carrier, book them in the local currency, even if you’re not based in the home country of the airline. Fares that are quoted in converted rates are typically more expensive. For example, a current search reveals a return economy class fare on United (April 28-30) costs US$958.66 when booking through the airline’s US website. However, the same search on United’s Hong Kong website quotes a fare price of HK$8,754 (US$1,128.76) – over 17 per cent more expensive. There are a growing number of flight reservation websites available, and all have their pros and cons. However, to ensure that you’re getting the best deal out there, we recommend checking multiple platforms before clicking the “book” button. 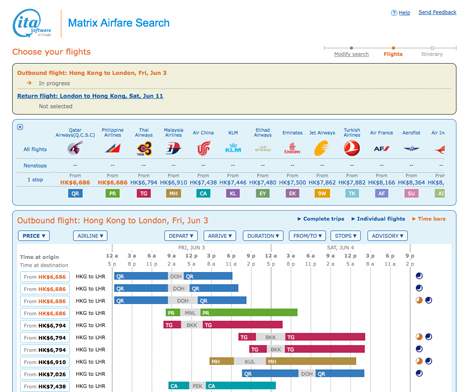 ITA Flight Matrix is an excellent flight search tool used even by industry analysts. The online platform offers a wide range of filters that enable users to focus their searches to best suit their individual preferences. For the price conscious traveller, the tool is even able to filter flight choices based on the cost per mile. This applies to flights with low-cost carriers in particular. Given that promotional fares offered by LCCs typically only apply to one-way fares, it is sometimes better to buy two one-way tickets as opposed to a roundtrip fare. By purchasing a one-way ticket at a heavily discounted rate, you’re likely to make significant savings even if the cost for the return flight is inflated. Taking the “fare drop” idea to the next level, the app “Hopper” not only monitors current prices, but can predict how the costs will change. In doing so, it is able to notify the user when is best to buy his or her ticket, or if they should wait. For example, the lowest available fare for a return economy class ticket between Singapore and Adelaide (for travel from August 2-10) currently costs S$925. 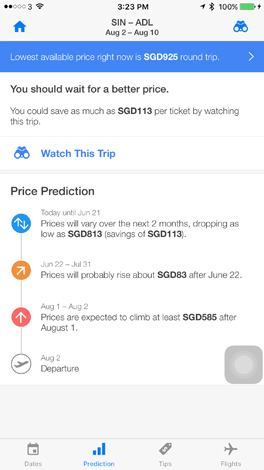 However, Hopper is able to predict that the price will vary over the next two months, dropping to as low as S$813. This would encourage customers to hold off on booking their flight until the fare has reduced.